Next to fried chicken, I think this is one of the favorite Pinoy fried food. And this is one of the simplest and easiest dish you can cook. Like breaded fried chicken, it is tasty, golden crispy outside and tender and moist inside. The ingredients are also easy to find and you can actually find them in your kitchen pantry and your freezer. There are also lots of ready to use breading mix you can find in most supermarkets so can omit most of the ingredients in this recipe. Aside from that, this is appealing to kids so it will be easy for you to please them. Serve it with your favorite dipping sauce and your are ready to enjoy this dish! In a bowl, combine flour, paprika, salt, pepper and chicken powder. Coat the pork chops with the flour mixture using a zip bag and shake to evenly coat the pork. Dip each pork chops in beaten egg and dredge in panko bread crumbs. In a pan heat oil and fry the pork chops in medium heat until golden brown. 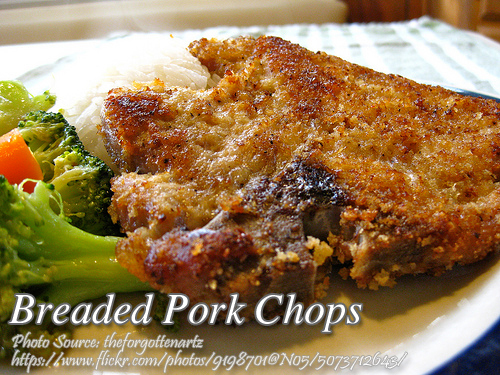 Fry each sides for about 5 minutes or more depending on the thickness of the pork chops. After frying, transfer the pork chops in a rack or a plate lined with paper towel to drain excess oil. Serve with catsup or any of your favorite dipping sauce. Thank u for d recipes u blog.